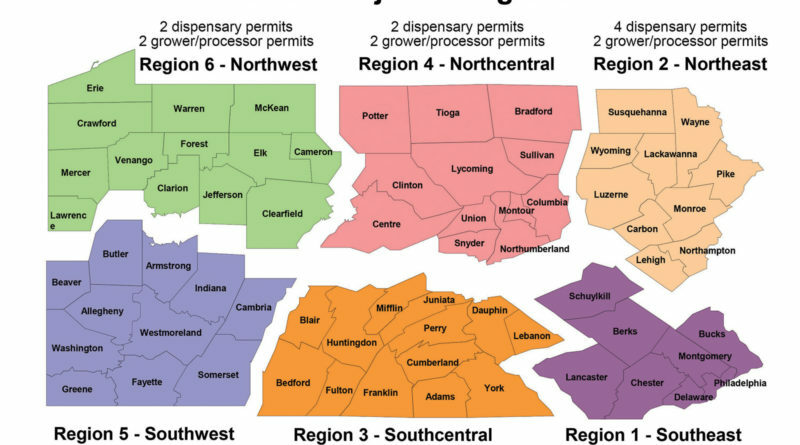 Pennsylvania Secretary of Health Dr. Karen Murphy and John Collins, director of the Office of Medical Marijuana, on Wednesday, revealed the breakdown of where medical marijuana dispensary permits will be granted throughout the six health regions of the commonwealth. There are 27 permits to be granted to applicants, with each recipient being allowed to operate three medical marijuana dispensaries, expected to open in mid-2018 the state officials said. Region 1 Southeast will be granted 10 permits, with 3 in Philadelphia, two in Montgomery and one each in Berks, Bucks, Chester, Delaware and Lancaster counties. Region 4 Northcentral will be permitted one license in Centre and one in Lycoming County. Licensees will have to identify a primary dispensary location, said Director Collins. There are restrictions on the two additional dispensaries. The next two dispensaries must each be in different counties than the primary location, but both must exist within the same geographic region. Director Collins said he expects the program to receive up to 900 applications for dispensaries and also grower/processor applicants. The application forms will be released on the health department website on January 17, 2017, the Pennsylvania Department of Health will release the application forms on its website and will accept submissions from February 20 to March 20, 2017. In addition to the 27 dispensary permits, Secretary Murphy said there will be up to 12 grower/processor permits to be granted in the first phase of the permit process. “To decide where to issue permits in this first phase we will use the department’s medical data as well as comments from the 5,000 patients and nearly 900 grower/processor dispensary applicants,” Murphy said. The state’s MMJ program, signed into law by Gov. Tom Wolf in April 2016 is planned for implementation by early 2018. It will allow medical marijuana for PA residents and under a doctors care for one of the following serious medical conditions outlined in Act 16: ALS (Lou Gehrig’s disease), Autism, Cancer, Crohn’s Disease, Damage to Spinal Cord Nervous Tissue, Epilepsy, Glaucoma, HIV/AIDS, Huntington’s Disease, Irritable Bowel Syndrome, Intractable seizures, Multiple Sclerosis, Neuropathies, Parkinson’s Disease, PTSD, chronic or intractable pain and Sickle Cell Anemia.